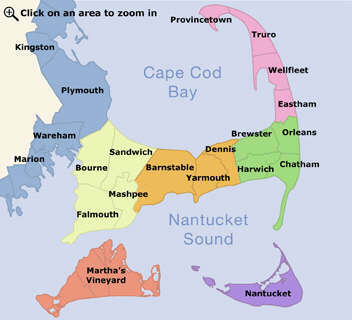 The Cape Cod National Seashore encompasses 43,607 acres of protected beaches, bogs, marshlands, and ponds. A truly pristine, beautiful, and special area of Cape Cod. The Pilgrim Monument was built in 1910 and is 252 feet tall. It was built to recognize the first landing of the Pilgrims that took place in Provincetown in 1620. Vacation is all about relaxing. What better way to compliment your time basking on the beaches than strolling through the many terrific museums and art galleries on the Cape and Islands. From the Kennedy Museum and Classic Sports Car Collection in Hyannis, the Nantucket Whaling and the Shipwreck and Lifesaving Museums on Nantucket, and the Martha’s Vineyard Museum in Edgartown, treat yourself to a wealth of fascinating information about the history of this unique area and view the artifacts that bring it alive for adults and kids alike. Or, if you are not a history buff, let our Vacation Planner point you in the direction of the myriad of different art galleries featuring eclectic displays of local and other fine art and crafts. A great alternative to sun and crowd exposure on the beaches during the day, museums and galleries also provide a lovely opportunity to prolong the enjoyment of a romantic dining experience in the evenings.